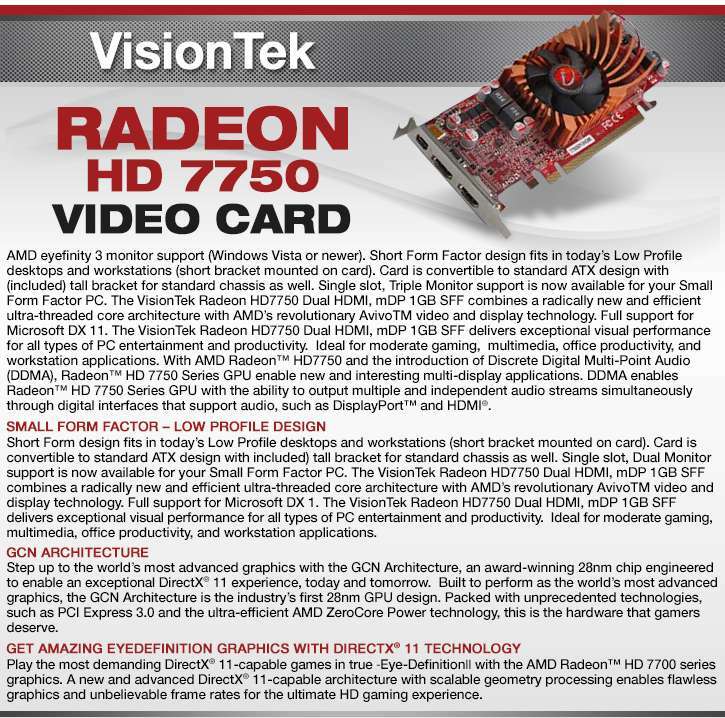 Get smoother game graphics and video renderings with the VisionTek Radeon HD 7750 900574 Video Card. This low profile video card features its AMD Radeon HD 7750 GPU and 1GB of DDR3 graphics memory to deliver stunning visuals effects and smooth-flowing video quality. Plus, it has a DirectX 11 support to let you enjoy more of the latest 3D games, 3D pictures, and 3D videos. You can also integrate multiple GPU for accelerated graphics output. For ultra-fast interaction with the motherboard, this video card is utilizing a PCI Express 3.0 interface. The VisionTek Radeon HD 7750 900574 Video Card is packed with additional technologies to offer a complete package of high-definition entertainment experience like the AMD Eyefinity for multi-display support and AMD App Acceleration for faster video encoding speed. Immerse yourself in a totally mind-blowing virtual environment with the VisionTek Radeon HD 7750 900574 Video Card; order it now!